Gangtok, Sikkim (India) -- Visitors from different parts of the country and world were treated to a rare dance performance by masked Buddhist monks at one of the oldest monasteries in Sikkim recently. Wearing masks representing their guardian deities, Buddhists monks danced to the beats of the cymbal in a traditional ceremony to ward off evil and welcome good spirits. Costumed lamas (monks) with gaily-painted masks, ceremonial swords and sparkling jewels leap and swing to the rhythm of resounding drums, trumpeting of horns and chanting of monks. 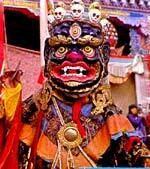 It is the annual worship ritual celebrated with religious masked dances on the 18th and 19th days of the 11th month according to the Tibetan Buddhist Calendar corresponding to the month of December - January. "Oh, the festival was lovely. It was very authentic. It was colourful. It was not something, I feel, that was put up for the tourists. It was something that was (being) done for the local people. So it was good to see," said Bruce Handel, a tourist from Canada, who had chanced upon theeremony while moving about Sikkim. For many other foreign visitors, it was a spectacle worth money. "As a tourist you do not get to see these things. We are very lucky (as) this happens only once a year. I think the traditions are very, very alive in Sikkim," said Joanna, who thought the entire sequence was straight out of dreams. Headquarters of the Kagyupa sect of Tibetan Buddhism, the 250-year old Rumtek monastery is situated 24 kilometers from Gangtok, the state capital. This masked dance by the monks is the colourful culmination of a ceremony of extensive prayer rituals for peace and harmony. Each dance begins with homage to the gods with a deliberately slow movement of feet. The rhythm slowly picks up in the second stage and reaches a feverish pitch towards the end. Tibetan monks hold the dance in high esteem. It is considered as a preservation of the wisdom preached by Buddhist teachings. Michael, another British tourist said he was very impressed with the idea of the learned monks performing the ritual. "I will remember the monks at the monastery we have seen today. These are the monks who spend all their time learning about Buddhism, practicing Buddhism and devoting their whole life to it," he said. With a total of about 250 monasteries, the culture of Sikkim is closely linked to Tibetan Buddhism. About 130, 000 Tibetan refugees are now settled in different parts of India with the Dalai Lama establishing his headquarters in Dharamshala. Sikkim is also the seat of 17th Karmapa Lama Ugyen Thrinley Dorje, the only senior monk to be recognised by both China and the Dalai Lama.